As the National Park Service celebrates its centennial this year, we are also celebrating the 10th anniversary of a national park we have right here in our collective backyard: the Captain John Smith Chesapeake National Historic Trail. Winding through much of the Chesapeake region, the nation’s first all-water national historic trail is as beautiful, and as precious to our nation, as its more famous sisters around the nation — the Grand Canyon, the Adirondacks, Yellowstone, etc. And it is of course the youngest; in 2006, President George W. Bush signed legislation establishing the trail, commemorating Smith’s exploration of the region from 1607–09. The trail is administered by the National Park Service Chesapeake Bay Office. The Chesapeake Conservancy, where I work, serves as the primary nonprofit partner. The effort to establish can be attributed to a number of major visionaries — Pat Noonan, founder of The Conservation Fund; Gilbert M. Grosvenor, president of National Geographic; Will Baker, president of the Chesapeake Bay Foundation; the Chesapeake Bay Commission; U.S. Sens. Paul Sarbanes of Maryland and John Warner of Virginia; and many others. 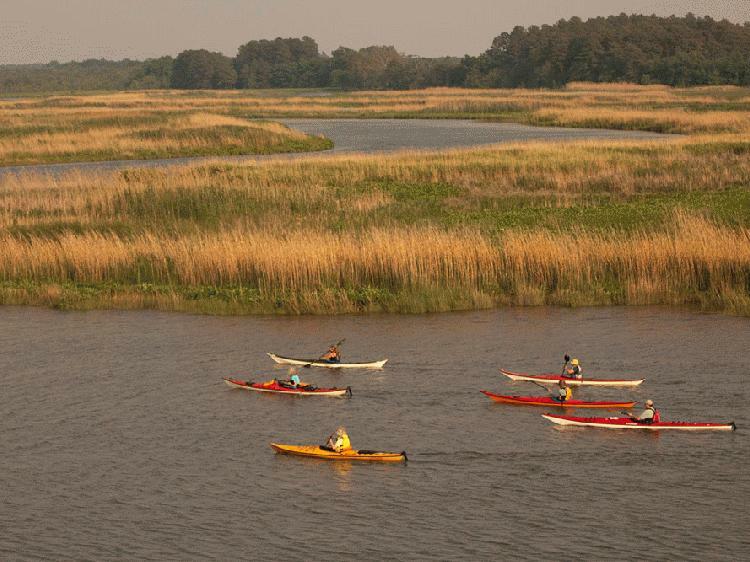 Thanks to their vision, the National Park Service is authorized to create new public access options (with 100 new sites since 2010) so more people can explore by boat or kayak the approximately 3,000 miles of the Chesapeake’s great rivers spanning from Cooperstown, N.Y., to Virginia Beach. The trail helps people connect with places evoking the Chesapeake of 400 years ago, with stories of American Indian communities and culture, as well as Smith’s voyages. One of my favorite places to start is Susquehanna State Park, where you can explore the scenic river that supplies 50 percent of the freshwater to the Chesapeake Bay and once served as the major highway in the region for American Indians to connect and trade. The Susquehanna’s history goes back thousands of years, evidenced by the Bald Friar petroglyphs. With support from the Chesapeake Conservancy, the petroglyphs are now displayed at Susquehanna State Park. A unique place to explore on the trail is Mallows Bay on the Potomac River, where you can see nature and history coexist. Mallows Bay is home to the “Ghost Fleet” of more than 100 wooden steamships built for the U.S. Emergency Fleet during World War I. Most of them never saw service and they were scuttled in this wide, shallow bight across the Potomac from Quantico, Va.
Today the wrecks support diverse ecosystems teeming with marine life. You can see the ships with your naked eye — from the park’s telescope on land or by hopping into your kayak and paddling up close. The Chesapeake Conservancy is a lead partner in a coalition advocating the designation of Mallows Bay as a National Marine Sanctuary. Another of my favorite spots along the trail is Fones Cliffs on the Rappahannock River. These amazing cliffs have a golden glow that radiates even on a cold rainy day. Now under threat of development, the cliffs provide an important habitat for the largest concentration of bald eagles on the East Coast. It is also one of the few places in the region that Smith and the American Indians living there 400 years ago would still recognize today. There are so many wonderful places to explore on the Smith Trail, you might be wondering where to get started. You can start online. Visit the National Park Service and Chesapeake Conservancy partner website at findyourchesapeake.com to plan your adventure. At the Conservancy’s website, you’ll find Riverview, which offers a virtual tour of many of the rivers on the trail. Similar to Google’s Street View, you can use the virtual tour to scope out your visit before you get there. Also available is a mobile-friendly Boater’s Guide for the trail and information about the Chesapeake Bay Interpretive Buoy System. The Smith Trail is much more than a place to explore: It’s a large, water-wrapped landscape. Just as the National Park Service became integral to conservation throughout the United States, for the last 10 years we have embraced the Smith Trail as the inspiration and framework for large landscape conservation and increased public access throughout the Chesapeake region.